Chromatin remodelers are multi-domain enzymes that reorganize the structure and placement of nucleosomes throughout the genome. Remodelers can be classified into distinct families that appear to specialize in particular tasks: disrupting nucleosomal wrapping and evicting histone cores, replacing histone proteins with specialized variants, repositioning nucleosomes into evenly-spaced arrays, and catalyzing nucleosome assembly. In the Bowman lab, we are focused on the Chd1 chromatin remodeler, which has been shown to both assemble and evenly space nucleosomes (Lusser et al., 2005; Pointner et al., 2012 ; Ocampo et al., 2016). Unlike most other remodelers, Chd1 is monomeric and therefore provides an ideal model system for discovering how remodelers work. Chd1 was named for three recognizable domains: a pair of N-terminal chromodomains, a central helicase-like ATPase motor, and a C-terminal DNA-binding domain (Delmas et al., 1993). 1. What role do the chromodomains play in the remodeling reaction? 2. 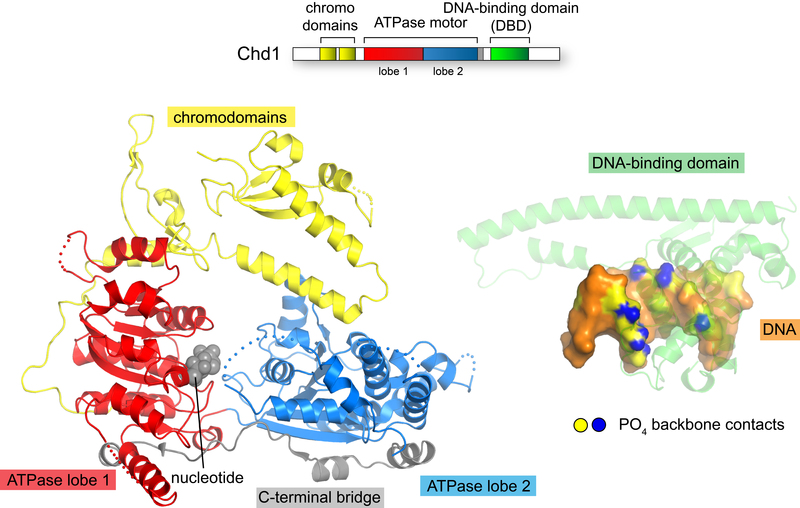 How does the Chd1 DNA-binding domain sense DNA outside the nucleosome core? 3. How does the Chd1 ATPase motor shift DNA past the histone core?